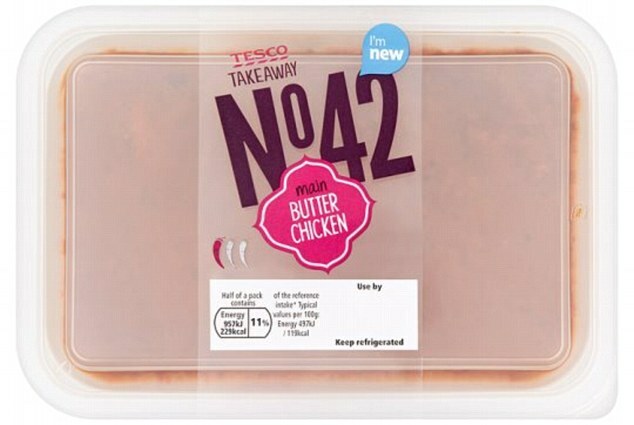 Supermarket chain Tesco have been forced to issue a recall notice concerning their own-brand Takeaway Butter Chicken after it emerged that the curry dish contains cashew nuts that are not listed on the label. The recall affects the 385g pack size, and is applicable to products with use-by dates of 24/01/2017 and 25/01/2017. With nut allergies regarded as one of the most prevalent and dangerous allergies commonly found in the UK, the seemingly minor mistake could in fact be a serious one if ingested by the wrong person. A notice from Tesco said: 'If you have bought the products and have an allergy or intolerance to cashew nuts, do not eat it. Instead return it to the nearest Tesco store for a refund (no receipt is required). 'Tesco is recalling the above product from customers and has contacted the relevant allergy support organisations, which will tell their members about the recall. The company has also issued a point-of-sale notice in stores.